The Titan 265 TC continues delivering the excellence of innovation and strength we’ve become famous for since 1870. The Titan 265 is based on a solid cast iron and steel construction for maximum durability. Our powerful hydraulic clamping and cutting yield up to 26 cuts per minute! Stainless steel table surface and an air table are available options for the Titan 265. The Titan 265 TC meets the toughest safety standards in the industry today. Light safety curtains, enclosed rear table, two-hand timed non-repeat cut buttons, and a knife safety latch contribute to our UL and CE certification. 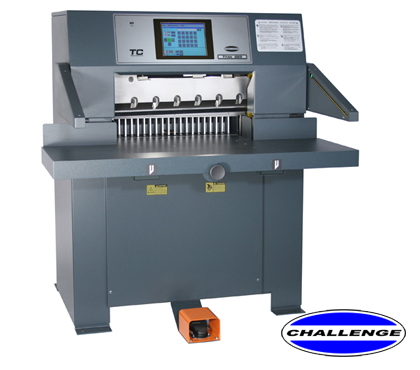 The intuitive 10.5" color touch-screen TC Controller allows variable mode data entry, automatic fraction to decimal calculation and unlimited program storage capacity. Clamp mark waste is reduced or eliminated with programmable electronic clamp pressure control per cut. Table Space in front of knife: 18.5" / Table Space behind knife: 28" / Overall Height: 59" / Overall Width with side tables: 54" / Overall Length: 69.5" / Net Weight: 1780 lbs. / Shipping Weight: 2020 lbs.